Hanau is famous for being the birthplace of the Grimm brothers, the publishers of the well-loved fairy tales. The city is also the start of the Deutsche Märchenstraße (German fairy-tale road), a scenic route that leads a few hundred km across Germany to Bremen in the north. Hanau's location on the junction of the rivers Main and Kinzig invites you to enjoy some beautiful river scenery. Not far from the river junction is the romantic castle Phillipsruhe and the picturesque suburb Kesselstadt. Located about 25 km east of Frankfurt, Hanau provides very good public transport and is well connected to the main Autobahnen (motor-ways) in the Rhine-Main area. It is easy to discover the highlights of the city and surrounding areas by bus and train. As a mainly industrial city, you might discover some "ugly" areas. However, this should not hold you off to explore the scenic parts of my home town with me. Use the quick links below to jump to any topic of interest. Let me show you the hidden treasures of Hanau. Discover one of those most underrated cities in Germany. Population - Bevölkerung: 90.934 (2014) including residents of the incorporated towns Grossauheim, Klein-Auheim, Steinheim, Wolfgang, Mittelbuchen, Kesselstadt. About 20% of the population are foreigners. Turkish and Italian people are in the majority among the foreign residents. District - Landkreis: Hanau is on the western edge of the Main-Kinzig-Kreis which is mainly a rural area with low mountain ranges. Almost all sights and attractions in Hanau can be easily reached by bus, I give you tips how to get there. 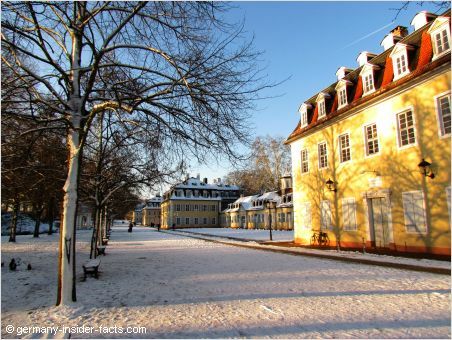 Wilhemsbad is a picturesque spa complex near the district Hohe Tanne in the northwest of Hanau. Named after his creator, crown prince and Count Wilhelm IV., the complex was built for the pleasure of the noble society. Situated in a large English-style garden, many features for entertainment were added: a huge horse-drawn carousel, a devils bridge and a pyramid. The historic carousel has been closed for complete restoration for many years. It is planned to be opened (and working again) in summer 2016. Also in the park is an island within a small dammed creek. Here rises a pseudo-medieval castle. It was built to look like a ruin, but housed an elegant apartment for the count. Walk along the avenue with grand old buildings, pavilions and enjoy the magnificent park. The park is open daily, no admission. Guided tours for groups by appointment. Tours of the castle (Crown Prince's rooms) are available for a fee from April-October: Sat 2pm, 3pm and 4pm; Sun every hour from 11am to 4pm. Arrangements for guided group tours can be made all year round. Click here to see more pictures of the castle and the museum. This 18th century baroque palace is a brilliant building complex located on the river Main in Kesselstadt. On the ground floor is the official wedding hall for citizen of Hanau. Aren't we lucky to be able to marry in a castle? The white hall (Weisser Saal) in the left wing of the palace is a restaurant where you can dine like a king. The huge terrace overlooking the river is open in summer and a beautiful place to relax. The palace is home to the historical museum with stunning displays of artistic craftmanship and a section about the Brothers Grimm. The castle park is a wonderful place for a leisurely walk, and the kids will have their fun as well. The Philippsruher Allee, the most beautiful boulevard in Hanau, leads from the Westbahnhof (train station west) along the river Main to the palace. How to get there: From the main train station or from market square bus #5 takes visitors to the castle, the name of the station is Schloss Philippsruhe. While you are here, don't forget to explore the old town of Kesselstadt just across the road from the castle. The Altstädter Markt was the central place of the old town (picture on top of this page). The beautiful half-timbered house was the town hall of Hanau which recieved Stadtrechte (city rights) in 1303. The former town hall is now the Deutsches Goldschmiedehaus (German House of Goldsmiths). Go inside to see exhibitons and learn about the gold and silversmiths' art in Germany. Goldschmiedehaus is open daily, except Mondays, from 10am to 5 pm. Admission is €2.50 for adults. As you walk a little bit further you come to the true heart of old Hanau. The Stadthalle (former stables), now integrated into the the modern Congress Park Hanau, and the opposite Stadtbücherei (library) building were parts of the old city palace complex which stood in the Schlosspark (castle garden). 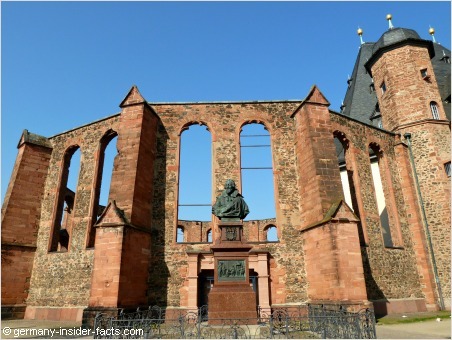 The beautiful Marienkirche (St. Mary's church) was first mentioned in the 14th century. Don't get confused, there is only one Hanau these days. However, until 1821 two cities excisted with their own fortification walls and two separate city councils. The baroque Neustädter Rathaus (town hall of the new town) was built in the 18th century on the market square. In front of the red brick building is the Brothers Grimm memorial that commemorates the famous sons of Hanau. The Marktplatz (market place) is the heart of Hanau. The place is surrounded by department stores and pedestrian malls. Relax at a cafe, and enjoy life. Between the market square and the Altstädter Markt is another main square, Freiheitsplatz. If you know Hanau from 10, 20, even 40 years ago, you won't recognise that place anymore. 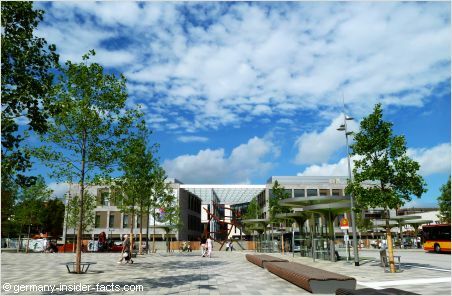 In 2012 the huge remodelling process called "Hanau baut um" had started. A large cultural and shopping centre was built on Freiheitsplatz. The bus terminal was also changed a lot to give it a modern appearance. This picture on the left was taken about a month before the grand opening of the complex (in September 2015) which is called "Forum Hanau". That's why you still see some fences in the photo. More than 90 shops, cafes, food stalls invite visitors to browse through the centre. The cultural complex includes the new home of the public library, the municipal archives and the media center with the local image archive. Opening time for shops: Monday to Saturday from 9:30am to 8pm. The library opens from 10am and from 11am Saturdays. The wildlife park Alte Fasanerie is an attraction for all animal friends, kids and adults alike. The huge park features woodlands, meadows, and open spaces. Huge enclosures give animals like deer, bisons, wolves, wild boars and elks space to roam. Smaller enclosurers are home to badgers, racoons, foxes and ferrets. In the bird aviaries the colourful pheasants are my personal favourites, but the snow owls look also beautiful. On weekends (only in dry weather) you can drive in a covered carriage throughout the park. Pony rides are offered for children. One of the most fascinating attraction is the monthly wolves howling night at full moon. 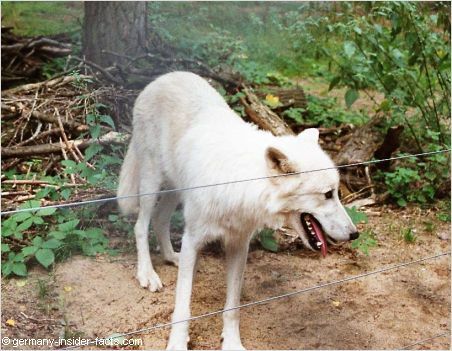 Ayla, Scott & Khan*, the older arctic wolves which were hand-raised by biologist Dr Marion Ebel in 2004, howls with the wolves. Inuq, Aslan, Monja, the younger polar wolves who came to the park in 2011, live in a different enclosure and are not too keen to howl. The Alte Fasanerie is in Hanau-Kleinauheim, and really worth a visit. Unfortunately, the wildlife park is not connected to the bus system in Hanau. The closest bus stop is Klein-Auheim Friedhof with bus #4 or #6 from Freiheitsplatz. From the bus stop it is still a 30 minutes walk to the park. * Unfortunately, Khan had to be put down on New Year's Eve 2015. As of summer 2017 the official howling performances were cancelled because of the the old age of Ayla and Scott. Update: Ayla died in January 2018. Explore the history of European dolls from antique times to the 21th century. The museum is a dream for everyone interested in dolls and toys. The museum is open Tuesday to Friday from 10am to 12 pm, and 2 pm to 5 pm, Saturday and Sunday from 10 am to 5 pm. Admission: adults 3.50 €, children 1.00 €, families 7.00 €. The palace is home of the historical museum, including an unique paper toy theatre museum. See fayences, silver and cast iron art, explore documents of Hanau's history. One room is devoted to the Brothers Grimm, with special exhibitions every now and then. The museum is open from Tuesday to Sunday from 11am to 6 pm. Admission: adults 4 €, 8 € for families. Access to the museum cafe is free. Deutsches Goldschmiedehaus (German House of Goldsmiths) see details in the section about the old town above. Frühhistorisches Museum (Prehistoric Museum) in the old castle in Hanau-Steinheim gives you an insight about work and life in past ages. Take the bus #4 or #12 from Freiheitsplatz, get off at the stop Albrecht-Dürer-Straße. 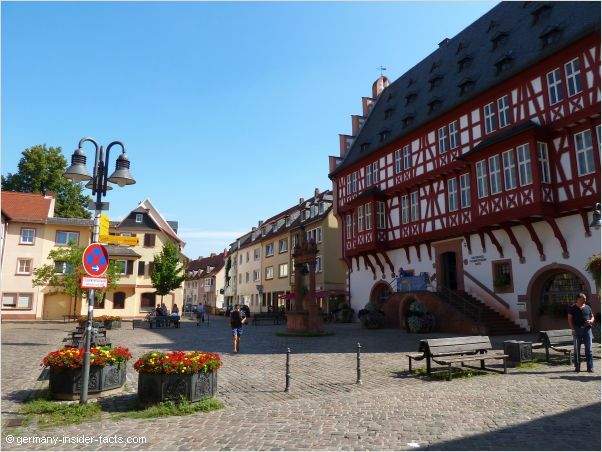 Take some time to explore the old town of Steinheim as well. Museum Großauheim introduces visitors to steam machines and other displays from the industrial history, along with the work of the local artists August Gaul und August Peukert. Bus #6 from Freiheitsplatz to bus stop Rochusplatz in Großauheim. Under the concept living museums all museums offer workshops for children and adults. You can even celebrate your kid's birthday in a museum. Hanau's long history could fill a book. Below I have listed the most significant events which have influenced appearance and life in Hanau until today. 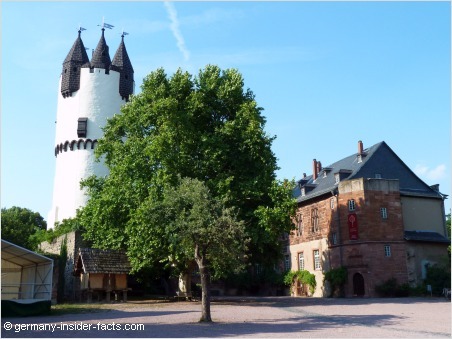 A castle, surrounded by arms of the river Kinzig, was first mentioned in 1143. 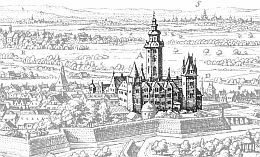 Over the centuries, the fortified castle was expanded, modernised and turned into a palace, known as the Stadtschloss. Hanau-born elector Wilhelm II. ordered the demolition of the oldest medieval part of the palace in 1829/30, despite its historic significance. Prussia annexed the electorate Hesse in 1866, therefore the palais in Hanau was not needed anymore as a residence of noble families. 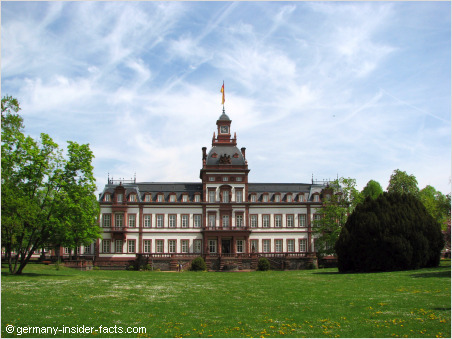 The city of Hanau bought the palace in 1890. The various buildings were turned into homes and government offices. 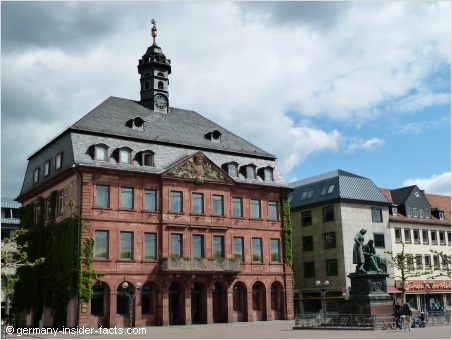 For some time in the 20th century the mayor of Hanau had his residence in one of the buildings. 1597 Calvinist refugees from the Spanish Netherlands and France founded the Neustadt (New city) in Hanau. 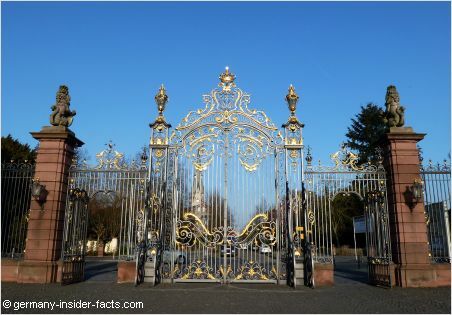 The refugees brought an enormous amount of capital and know how to Hanau. Goldsmiths, weavers and other craftsmen settled in the flourishing Neustadt. The Dutch-Walloon double-church was built early in the 17th century. The church was destroyed in 1945, only the smaller Dutch part was rebuild. The ruins of the Walloon part remained as a memorial. During the Thirty Years' War (1618-1648) Hanau was a base for the Swedish Army under the Scottish General Ramsay. 1635 imperial troops under General Lamboy besieged Hanau for 9 months, the situation in the city was terrible. Finally, Wilhelm V. of Hesse Kassel, an ally of the Swedish king Gustav II Adolf, freed the besieged city. Since then, citizens of Hanau held an annual church service to commemorate the freedom, which over the years lead to the annual Lamboyfest festival. Hanau was nearly totally destroyed during WW II. After a British air strike on 19th March 1945 only seven houses remained in the city centre. The old town lost its medieval appearance. Sadly, this happened only 10 days before American troops invaded Hanau, and the war came to its end. An annual service at the main cemetery on the 19th March commemorates those who lost their lives on that day. The quick reconstruction of houses soon after the war didn't care for prettiness and rehabilitation of historic ruins. The city needed living space badly. Only a few old buildings were reconstructed in the 50s and 60s. US American troops came as occupying forces in 1945. They soon helped to develop the non-existent infrastructure and removed debris in the destroyed city. American GIs brought sweets and chocolates for the children, shared their supplies and helped whenever they could in those hard years after the war. Teenager were impressed by the American Swing, Jazz and Rock'n Roll music, which was mostly disapproved by their parents. The American Way of Life influenzed the youth in the 50s and 60s, not only in Hanau. A lively music scene with bars and live music developed in Hanau at that time. The American troops left Hanau in 2008, the end of an area. An exhibition in 2006 (60 years Americans in Hanau) and the recent movie Rollover Hanau recall the times when Hanau was the party metropolis of Hessen, and appreciates the German-American friendship in general. I found this video on You Tube which shows the great affection by a Hanau-born Amercian for my/our home town. As you can see from many contributions by readers, Americans who were stationed at Hanau, have still fond memories. The Brüder Grimm Festspiele (Brothers Grimm Festival) is a well-known in Hessen and all over Germany. Soak up the mystery and fairy tales of your childhood. Step back into the time when whiches, princesses and heroes were part of your real world. Children and adults love the magic atmosphere of the fairy tales. The Brothers Grimm festival season 2016 includes "Frau Holle", "Vom Fischer und seiner Frau", "DDer Teufel mit den drei goldenen Haaren" from the collection of fairy tales by the Brothers Grimm and "Faust I" by Johann Wolfgang von Goethe. 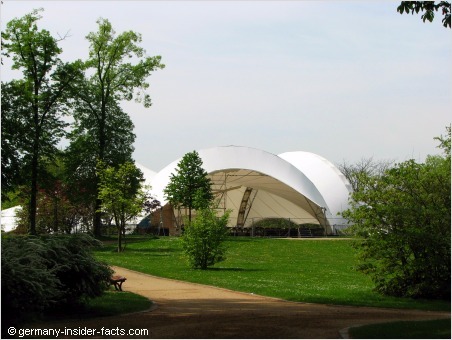 The festival takes place in the amphitheatre in the park of Schloss Philippsruhe. Thanks to the covered theatre you don't need to worry about rain or sunshine. Tickets cost from €13.00 to €23.50 depending on the play, seat and whether or not you book in advance. School classes and Kindergarten groups cost €5 per child. The 2017 festival season begins on 12th May and ends on 30th July. New this year is a cooperation with the family academy, presenting the play "Burning Love" in the Dutch-Wallon Church. The City of Hanau helds a summer events series called "märchenhafter Sommer" (magical summer) with concerts, festivals and much more. Just ask at the tourist information centre what is on when you are in Hanau. Lamboyfest is a traditional festival on a weekend before or after the 13th Juni, it commemorates the victory over general Lamboy who besieged Hanau for 9 months. Lamboyfest 2017 is from 9th to 11th Juni in the streets of the old town. As usual there is a large cultural program with live musik acts (6 stages), a historical market, juggler festival and good food and drinks provided by local associations and restaurants. Every year Lamboyfest is an exciting event that attracts visitors for one weekend. Perhaps you want to stay in Hanau for the festival next year? The farmers market on the market place is held twice a week, on Wednesdays and Saturdays. 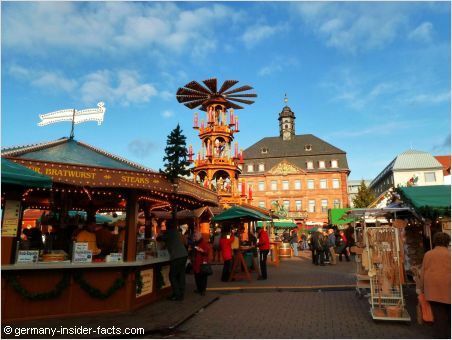 With more than 100 stalls it is one of the largest in Hessen. And the Brothers Grimm on their monument are always watching what's going on! The market offers fruits, vegetables, honey, flowers, bread, meat and sausages, cheese, and much more. Especially in spring and summer the colours of flowers and fruits are a feast for the eyes. A visit to the market is one of my favorite activities on a Saturday morning. From the end of November the farmers market has to move, because the beautiful Christmas market inspires people for the coming Christmas season. More than 70 stalls offer Christmas ornaments, candles, toys, arts and crafts. It is a great place to find a Christmas gift. Let the smells of bratwurst, hot soups, roasted almonds whet your appetite. Sip a glass of Glühwein (mulled wine) or hot cider to warm your hands, and enjoy a wonderful Christmas atmosphere. There are two carousels for children and a historic ferris wheel. Boy, what a fun my friend and I had on that ride last year. And you can take fantasic photos from the ferris wheel as well. In 2017 the Christmas market starts on 27th November and is open daily from 11am to 9pm until 22th December. How to get to Hanau? Hanau has also a good connection to the major Autobahnen, so travelling by car is no problem. Rhein-Main airport in Frankfurt is only 22km from Hanau. The airport is connected with Hanau by S-Bahn (S8, S9). Even a taxi is affordable if you are tired after a long flight. InterCityExpress trains from Berlin, Munich and other German cities stop frequently in Hanau, so getting here by train is quite easy. Once you are in Hanau, there is a good network of buses to discover the city and the suburbs. Almost all highlights are only a short walking distance from a bus stop. The Hanauer bus company is member of the RMV, the Rhein-Main-Verkehrsverbund. So if you buy a single train ticket from say Frankfurt to Hanau, you can use the bus from the train station in Hanau to the city with the same ticket. If you plan a sightseeing tour in Hanau all day, it is a good idea to get a day ticket which is valid all day for buses in Hanau and to the suburbs. 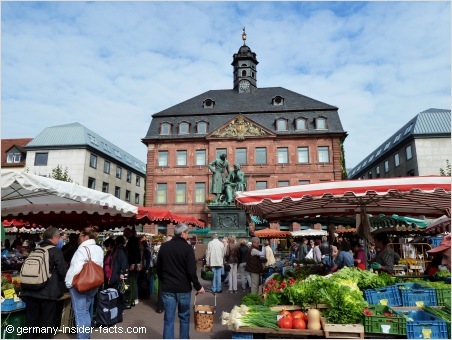 Want to visit Frankfurt and its attractions from Hanau? You can take regional trains from Hanau to Frankfurt Hauptbahnhof, or the S-Bahn which stops at several points within Frankfurt. When you plan a visit it is a good idea to check out accommodation possibilities in advance. Hotels are often fully booked if there is a major fair in Frankfurt. Use the search box to let HotelsCombined compare the offers from major online booking services. The tourist information centre offers info about festivals, markets and special events. Pick up brochures and ask for guided tours. They also sell nice Hanau related souvenirs and post cards. Visitors can also get brochures, souvenirs, tickets and other information in the new Hanau Laden at Freiheitsplatz. This shop has extended opening hours and is also open on Saturdays. You see Hanau is a fairly green city, and it is surrounded by woods and forests. Right-click on the "View Hanau Germany in a larger map" and open the map in a new browser tab or window. Continue to read my Hanau guide, and explore the places on the map. Read more stories by visitors to Hanau, or add your comments. Due to lots of spam, all comments are moderated. So it will take some time until you see your comment on the website. Thank you for your understanding.